La Peyriere to jeden z najpiękniejszych przykładów francuskiego gospodarstwa, które można znaleźć w samym sercu Aveyron w południowo-zachodniej Francji. Usytuowany na wzgórzach w pobliżu miasta La Fouillade i zaledwie 30 minut od ulubionej wioski Francji 2014 i 2015 roku, Cordes sur Ciel i St Antonin Noble Val. Zapewnia doskonałą ucieczkę od codzienności, ale jest w zasięgu 60 minut jazdy od 8 'Beaux Villages de France'. Bardzo typowym przykładem lokalnej architektury z pięknym dachem "fish scale" płytek łupków. Odnowiony w bardzo wysokim standardzie i nienagannie utrzymane do tej pory. Zachód słońca nad basenem i kuchni jest nie do przebicia! Właściwość korzysta z pięknej okolicy na zewnątrz, z tarasem z widokiem na basen z podgrzewaną wodą i grillem (basen jest otwarty od maja do października) i owinięty wokół pola o powierzchni 4 akrów, aby zapewnić Ci tyle prywatności, ile możesz sobie życzyć. Położony na wzgórzach 5 minut od Lunac, wsi z Boulangarie i 10 minut od La Fouillade, która ma główną supermarket. Jesteśmy niesamowicie szczęśliwi, że znajdujemy się w odległości zaledwie 15 minut od zachwycającej wioski Najac w Beaux. Nieco dalej jesteśmy 30 minut jazdy formularz 3 wspaniałe miasta ... Saint-Antonin-Noble-Val, z przepięknym rynkiem niedzielę i głosowali najpiękniejsze miasto we Francji w 2015 roku. Następnie na południowy wschód, Cordes sur Ciel, miasto na wzgórzu z pięknymi restauracjami i sklepami, zostało uznane za najpiękniejsze miasto we Francji kilka lat wcześniej! Na północy znajduje się Villefranche de Rouergue, kolejne oszałamiające miasto z pękającym czwartkowym rynkiem. Odwiedź stronę internetową, aby uzyskać więcej informacji na temat domu i co robić w pobliżu. We enjoyed a sun filled stay in October 2018 (yes, sun in October!) and can't fault the property. A wonderful outdoor space with heated pool to enjoy the sun and a warm and cosy house thanks to the fantastic wood burner by night! I even got to enjoy some road cycling out on part of the smooth Tour De France route. Heaven! Two weeks of peace, tranquility and the occasional ping pong and pool tournaments! The setting is wonderfully off the beaten track but it is only a short drive to local shops and bars. The pool was brilliant in the hot weather, the pool toys great fun and we could have stayed in there the whole time. Lots of places to visit nearby, recommend the Najac night market, canoeing and tree top rope walks. And for a longer day trip for engineering nerds you can visit the Millau viaduct. Pierre and his wife looked after us really well and Pierre is a great source of knowledge for the local area. The house was really comfy and the downstairs TV room lovely and cool and a great place for all the family to watch DVDs whilst escaping the heat wave. The kitchen was well equipped for cooking for 8 and the cooker, dishwasher and washing machine all worked well (we have stayed in other cottages were all three have been a challenge! )The local countryside is beautiful - and hilly - and a great opportunity to practice your running and cycling before a well earned meal watching the bats fly in and out of the barn. Thank you Chris and family for the welcome pack and for sharing your cottage with us, when we next need space for my whole family we'll be back! Just returned from a fantastic couple of weeks at this property. If you are looking for break away from the rat race for a week or two, then La Peyriere will definitely fit the bill. We flew into Toulouse and La Peyriere is a steady drive up the motorway and then a few local roads… ending up in some small lanes. We arrived in the late evening which didn’t seem to phase the local contact Pierre, who visited us on the first night to make sure we knew what’s what. 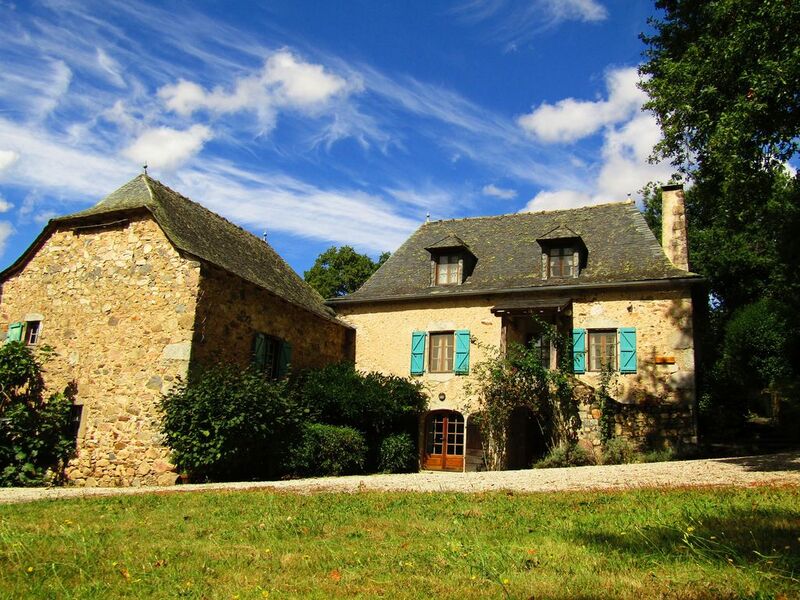 The description/reviews on the property are accurate - La Peyriere is a very traditional French farmhouse, in a quiet location, with the usual quirks of an older building – think squeaking floorboards, wooden furniture and rustic charm. Happy to see that the usual “guest information/rules” notices have been kept to an absolute minimum, so the property keeps it’s homely character. That said, there was a very professional welcome book (also supplied electronically) and plenty of leaflets available for those all important days out to the local attractions – Cordes-sur-Ciel is definitely worth a visit. Just be aware that this is a traditional farmhouse in a rural location, so the local wildlife will come and visit; on our first morning it was very pleasing to see a young deer walk through the grassed area and on into the woods, and we counted at least six geckos around the pool area alone. However, all the windows had integrated insect screens, so could be left open to get the air through without any worries of letting anything in – just a shame they weren’t on the doors too. We travelled as two related couples, so the single shower room on the lower level didn’t really cause us any issue but if you are travelling with people you do not know so well, then you may need to take this into account, especially as there are two flights of stairs to negotiate from the upstairs bedrooms – there’s a certain knack at keeping your modesty intact when wrapped only in a towel! The pool was a very welcome and refreshing addition given the ambient temperature was well above 30C most of the time we were there and there was a good selection of inflatables for the younger (or young at heart) guests. Sunbeds were made of good quality wood (far superior to the usual white plastic IMHO) and the umbrellas plentiful. Shame it such a distant memory... and its only been a week! Fantastic location, fantastic house, frantastic weather! Lovely, traditional french farmhouse. Very comfortably furnished with everything we could need. Wonderful, heated pool meant lots of lazy days reading and swimming in the beautiful french countryside. Would highly recommend especially to families as there’s lots to keep the children occupied: from the pool to the snooker table. There’s also a selection of games provided in the cupboard in the lounge- couldn’t have asked for more!! Great, speedy contact from the owner and very accommodating with requests. Pierre was a wealth of local knowledge when he visited to tend to the pool. Fantastic outdoor BBQ and amenities provided in the kitchen.